4/12 from the 2010 Treasure Hunt series. 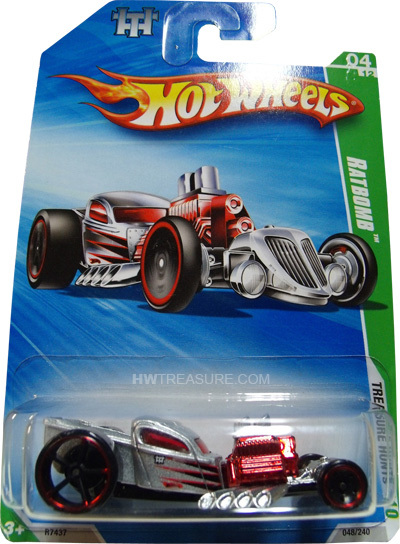 The Ratbomb sports silver metalflake paint with black and red scallops, “TH”, and the Hot Wheels logo on the sides. It has a red chrome engine, red tinted windows, red chrome interior, and a black metal Malaysia base. 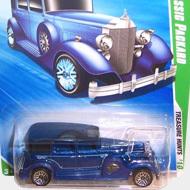 There are black skinny wheels on the front and black Open-Hole 5-spoke wheels on the back. 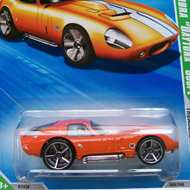 Both wheel types have red rims.